Whoever thought parking lot birding could be so productive? 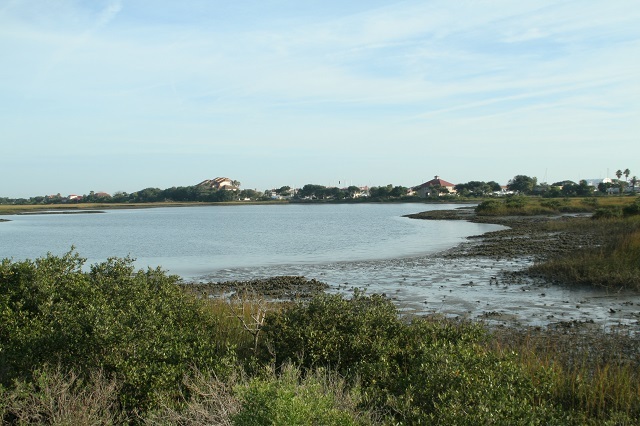 Situated in the middle of a salt marsh, with mudflats, oyster bars and open water habitats, this boat ramp and parking area at the west end of the Vilano bridge provide great viewing opportunities for shorebirds, gulls, terns and wading birds. Low tide and spring/fall migration are the best times to visit, but visit in winter for a chance to see loons and ducks are present in winter, and year-round for Clapper Rail and Black Skimmer. Roseate Spoonbill, Whimbrel, Marbled Godwit, American Avocet and White-rumped Sandpiper have been found here during migration and pelagic seabirds such as Sooty and Bridled Terns during stormy weather. You never know what you mind find here, in November 2012 a Lark Sparrow was spotted at the park. In fact, this site can be especially good during or after rains – just bird right from your car. Also check the mudflats across the road from the sidewalk for more shorebirds and waders (a scope is handy here). When motorized boat traffic is low, you may wish to paddle the marsh for additional viewing opportunities. Note: this boat ramp is extremely busy on weekends and holidays, so time your visits accordingly.